When setting up and experimenting with your print configuration, remember that when you click the print button on the GTX toolbar, the printout is sent to your word processor and not directly to your actual printer, which allows you to try out various settings and evaluate them without initially committing the printout to paper. Also bear in mind that, depending on the number of fields, or data columns, that you select to be included in your printout, you may need to alter the Page Orientation to print in 'Landscape' rather than 'Portrait'. To configure your printout, on the menu bar click on Setup, then Print. The Setup Printout Parameters box will open on the Parameter Order tab, and you will see that some of the checkboxes are already ticked – this is the default setup which is quite basic. Firstly you need to decide which of the available elements of the printout you wish to use. For the purposes of explanation let us assume that you would like an output similar to the section of printout below. As you can see from the example below, setup Printout allows you to specify not only your printout’s data content, but also the typeface, the font size, font style and colour, page orientation and size and other formatting choices such as blank lines and underlines. 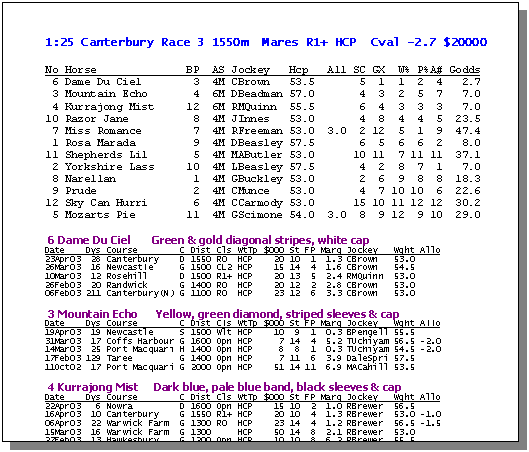 Start by removing the ticks from all the checkboxes, then in this order, tick: Race Info, Parameter Heading, Parameter Info, Horse, Form Heading and Form Info. You will see under the Order column on the left, that numbers will appear as you check the various sections. This indicates the order that these sections will appear on your printout. If you have Photo Finish selected, there are more options relating to the print output of Photo Finish on the Customize Photo Finish tab of this Setup Printout Parameters box. If you have Form Info selected, there are more options relating to the print output of form on the Customize Form Printout tab of this Setup Printout Parameters box. 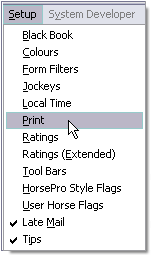 For example, if you wanted to print only the last three runs of each horse’s form, the Customize Form Printout tab is where you specify that limitation. Please note that if you enable the Form Info – filter in the Print Setup, the printed form will be affected by any Form Filter that you have in use on the Form View of GTX. 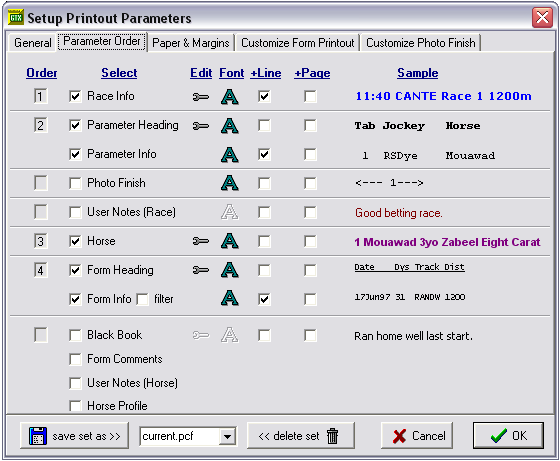 For example, if at the time of using the Print function, you are using a Form Filter to exlude wet tracks in the horse’s past runs, those wet track runs will not be included in the printout. Please note that any time during making multiple changes, you can save the changes by clicking the ‘save set as >>’ button, making sure that ‘current.pcf’ is showing in the small text box beside it. Regardless of whether you make progressive saves during your changes, you must save your configuration when you have finished all your changes, before you exit Setup Printout Parameters. The Save Settings function allows you to create and save multiple print configuration files if you so wish. If you want only one print setup, it is OK to just use the current.pcf as your sole print configuration. However, when you decide to create an additional printout configuration, you will need to save the 'current.pcf' with another name. The reason for this is that GTX uses only the 'current.pcf' as the print configuration file, no matter how many pcf files you have created. How it works is this: Say you have three print config files - 'abc.pcf', 'def.pcf' and 'ghi.pcf'. On this occasion, you want to use the print output as defined by 'def.pcf', so you select it from the drop list and click 'OK'. The current.pcf now contains all the settings of the 'def.pcf'. The current.pcf adopts the settings of the print configuration file last selected - that is, the currently selected file. It will remain as this until something else is selected. To save a new print configuration file after you have made your selections of data columns, fonts and formatting, click once on current.pcf and it will be highlighted. Then just enter your chosen file name - anything that means something to you, then click the save set as >> button. Anytime you want to go back to this particular print configuration after you have used another one, select it from the drop list, then click the OK button. Its settings will remain in the current.pcf until next time you change it.